How To Reactivate The Soft Bounced Emails In Your Lists? In this article we're going to touch on lots of things as they relate to soft bounced emails and the reactivation process that MyBizMailer has in place for you. Why do emails soft bounce? Why would I attempt to email these softbounced emails again if ISP’s like Yahoo and Gmail don’t like to see me emailing them? How often should I attempt to reactivate softbounced emails? How do I reactivate soft bounced emails? There’s tons of everyday common reasons why an individual’s email address might be soft bouncing when you attempt to send them a campaign from the MyBizMailer platform. Just to make sure. We’re not saying you should attempt to use the new soft bounce reactivation process every week. An idea would be to work it into a quarterly list hygiene protocol that you put in place for your business. How often should I attempt to re-activate softbounced emails? Like we mentioned above – it may be a good idea to use the soft bounce email reactivation process a couple of times throughout the year. Try once a quarter or during the spring and fall. 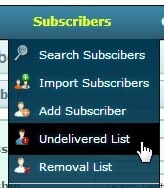 Step 1: After you've logged into your MyBizMailer account find and click on the "Undelivered List" option that is under the "Subscribers" section of the main nav bar. Depending on the amount of emails that are currently tracked as soft bounces you may want to adjust the default page display size to make this process a little bit easier for you. This option is located on the right hand side of the page. Step 2: Now that you can see a list of the emails that are currently in the MyBizMailer as "Soft Bounces" for your account you have two different options on how you'd like to manage and use the process. With this option, go through the list of emails on the page and select the ones that you'd like to apply the reactivation process to. 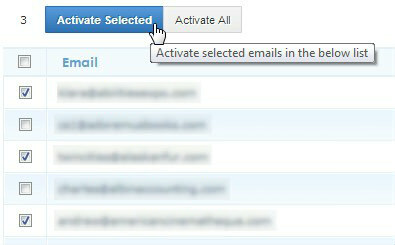 Once you're finished selecting the individual emails from the list click on the "Activate Selected" button. 1st: If you'd like to use this option and reactivate all the emails that are listed on the page then the first thing to do is to click on the little radio button at the top of the rows beside the word "Email" (you'll see an image below). After you've clicked that option all the email addresses that are listed on the page should now be selected. 2nd: Click the "Activate All" button.